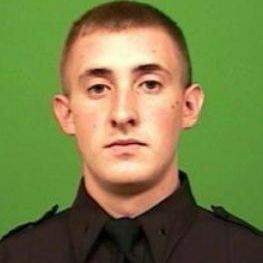 Brian Moore, the NYPD officer who was shot in Queens Village last weekend, has died, according to a report from the New York Post. The Post reports that Moore’s family took him off life support on Monday morning, and that NYPD Commissioner Bill Bratton was seen entering the hospital around 12:30 p.m. Moore was 25. Moore was shot in the left cheek on Saturday evening by 35-year-old Demetrius Blackwell, who was arrested and charged with attempted murder and criminal possession of a weapon. The Queens district attorney upgraded that last charge to first-degree murder after news of Moore’s death emerged. Blackwell is a former convict who previously served five years in prison on an attempted murder charge. He was released in 2005, then spent 2007–2008 in prison for violating parole.